News | Moviemem Original Movie Posters - EDGE OF THE CITY Daybill Movie Poster Original or Reissue? 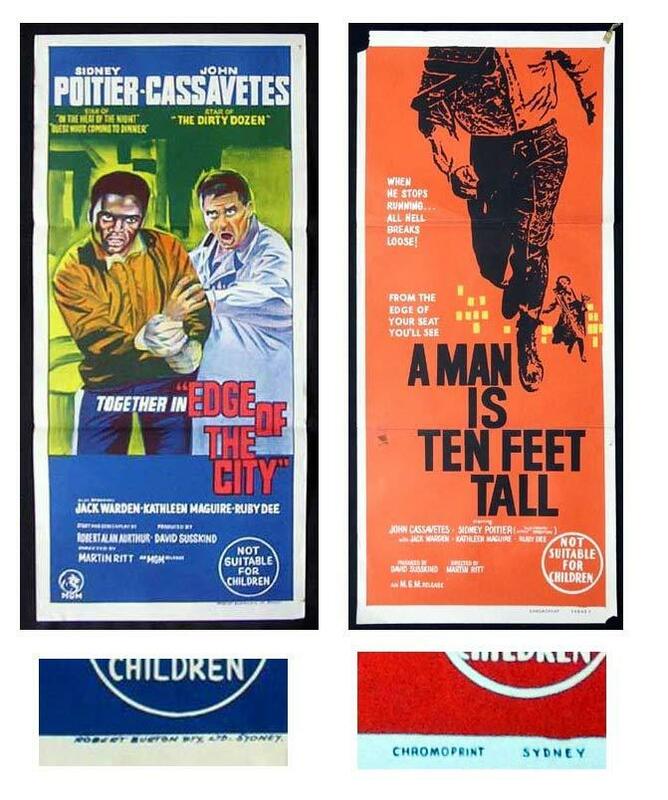 A hand litho daybill for Edge of the City (pictured to the left) has turned up fairly regularly on ebay.There are some obvious clues to prove that the Edge of the City daybill is actually a late 1960s re release with Sidney Poitier given top billing. Note the reference to In the Heat of the Night, Guess Who's Coming to Dinner and The Dirty Dozen. This very clearly indicates that the poster must have been printed after 1967. The original title for the international release of the film was "A Man is Ten Feet Tall" and the original daybill is shown on the right, printed by Chromprint who printed daybills for a short period from 1957. The original daybill for A Man is Ten Feet Tall is very rare and features the Saul Bass design.